The reason why this is coming a bit late is because I want to confirm if it's really working before I drop it here. This is actually the latest FB Tweak right now and it's for Etisalat users. So guys get your Etisalat sim card, dust it up and come along with me as I take you through the latest in the free browsing world. The good thing is that this tweak is absolutely free which means it doesn't require any airtime though I will advice you to make sure you don't have any money on your sim card before you try it to avoid stories that touch. First, Make sure your phone's APN settings is in default. 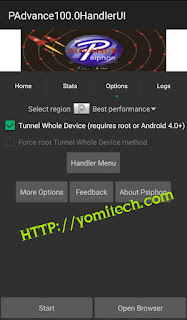 >> Download Psiphon handler by clicking on this LINK. >> Install and launch the Psiphon handler. >> Proxy Type: Reverse Proxy. >> Tick "tunnel whole device". >> Click on the options tab. >> Make sure connect through an HTTP proxy is un ticked. >> Go back and connect. All what you have to do next is to wait for a couple of minute while it connects. Note: This tweak is tested and confirmed. If it's not working for you, go over the all procedure again, make sure you have a very stable and strong 3G network and also wait for about 5-20mins for it to connect. Dont know why dz is trick is not work for me,av tried netify,zyphon even psiphon stil yet he no work...abeg mr yomi any solution? Mine is working but it keeps disconnecting whenever am watching youtube.com or attempts to download. How can I solve this?